Late goals from Edu Garcia and Cyril Kali ensured that the fans at the Jawaharlal Nehru Stadium in Kochi got their money's worth as Kerala Blasters and ​ATK played out an entertaining 1-1 draw as the ​Indian Super League returned on a brilliant note after the winter break. Steve Coppell's ATK who are still in the race for a top four spot brought in Pritam Kotal and Edu Garcia whereas Kalu Uche is fit again! He made four changes to the side that got beaten 1-0 by Bengaluru last month. Ankit, Everton, Lanzarote and Balwant made way for Kotal, Halder, Garcia, Uche. Meanwhile, Vingada made four changes to the side that was beaten 6-1 by Mumbai City on 16 December. Out went Zakeer, Narzary, Edathodika and Pekuson who were replaced by Kali, Krcmarevic, Karuthadathkuni and Poplatnik. Young Dheeraj started in goal. Head coach Nelo Vingada has named a strong @KeralaBlasters XI for his #HeroISL debut while @Edu_Garcia90 makes his first start for @ATKFC as Kalu Uche returns from an injury #BreakKeBaad! In the transfer window, more than the ins, Kerala had to bear the brunt of a host of departures. But, they managed to hold onto their most prized possession, Sandesh Jhingan, who started the game. Both teams looked positive from the outset but the first chance of the game fell to Kerala Blasters' Poplatnik in the third minute. Prasanth K delivered in a beautiful cross from the right flank and Matej Poplatnik jumped to reach it but could only glance it wide of goal. The rest of the first half saw impressive performances from Kerala Blasters especially Poplatnik, Prasanth and Stojanovic. Right at the end of the half, Dheeraj Singh was called into action and he made a brilliant stop from Edu Garcia's attempt to ensure parity in the game as the half ended goalless. Both teams started the second half at rampant speed, trying to get ahead by the hour mark. ATK came up with the first attack in the 46th minute. Ricky lashed in a cross and Gerson went in first time. Dheeraj pulled off a save and Lakic-Pesic cleared it out of danger. Kerala broke with a counter right away but Ricky blocked Stojanovic in his tracks on the half way line in the 49th minute. ATK suddenly looked much better than the first half. Edu Garcia had an attempt at Kerala's goal in the 53rd minute but Dheeraj came up with a great save to deny ATK the opening goal. Garcia looked in ominous form as he changed flanks in the 55th minute only to be fouled by Kali. ATK got the best chance of the match two minutes later. Halder played the ball wide to Rane and his cross saw Hitesh fail to tap in as he fell short in his attempt. Both teams conjured attack after attack till the first substitution took place in the 68th minute as ATK brought in Everton Santos for Uche, who did not look 100% fit on the night. Kerala got a decent chance in the 70th minute. Nikola chipped the ball over ATK's defence and Poplatnik, who was inside the box headed it back to Len. The Indian winger slammed it on the volley but his attempt went looping over the bar. ATK brought in Komal Thatal in place of Jayesh Rane in the 72nd minute in order to bring some pace on the wings. Kerala had two chances in quick succession but they failed to convert any of them as frustration grew for Nelo Vingada's side. ATK got a corner in the 80th minute which they failed to capitalise on before Kerala countered and found themselves in a two on two situation before Johnson came in to save ATK. 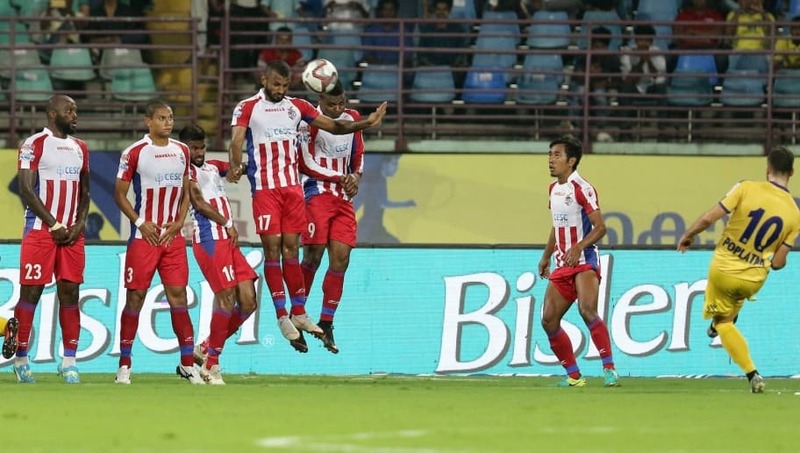 ATK struck in the 85th minute of the game simply because Blasters grew impatient and Lalruatthara conceded a silly free-kick with a reckless foul on Edu Garcia in a dangerous position. ATK capitalised and went ahead via Edu Garcia who scored from a brilliant free-kick. 85' GOOOOOOOOOAAAAAAAAAAALLLLLLL! @Edu_Garcia90 deceives the @KeralaBlasters wall and @dhee_singh01 by slipping his free-kick low to find the bottom corner! @ATKFC take the lead! However, even with five minutes remaining, the game wasn't over as Kerala hit back inside three minutes from conceding the first goal. ATK brought in Lyngdoh in place of Edu Garcia and just a minute later in the 88th minute, the Blasters equalised and the stadium erupted. Kali's cross found Poplatnik, who headed the ball into the ground and it bounced off the crossbar and went into the net as the Blasters made a thunderous comeback into the game. 88' GOOOOOOOAAAAAALLLLL! Poplatnik gets his head on the ball and it picks up a deflection off Vieira before going in off the underside of the bar! @KeralaBlasters are level in Kochi! Kerala made two changes in added time at the end of second half and looked happy to gain a point from a decent game which lit up in the final quarter of the clash. Both teams stay sixth and eight in the ISL points table respectively.